Olivia’s Overlook is at the center of the 734-acre Yokun Ridge reserve in the heart of central Berkshire County. This popular overlook is also the trailhead for 6 miles of trail. From the overlook side of Lenox-Richmond Mountain Road, access the Charcoal Trail, with a connection to the Brothers Trail. 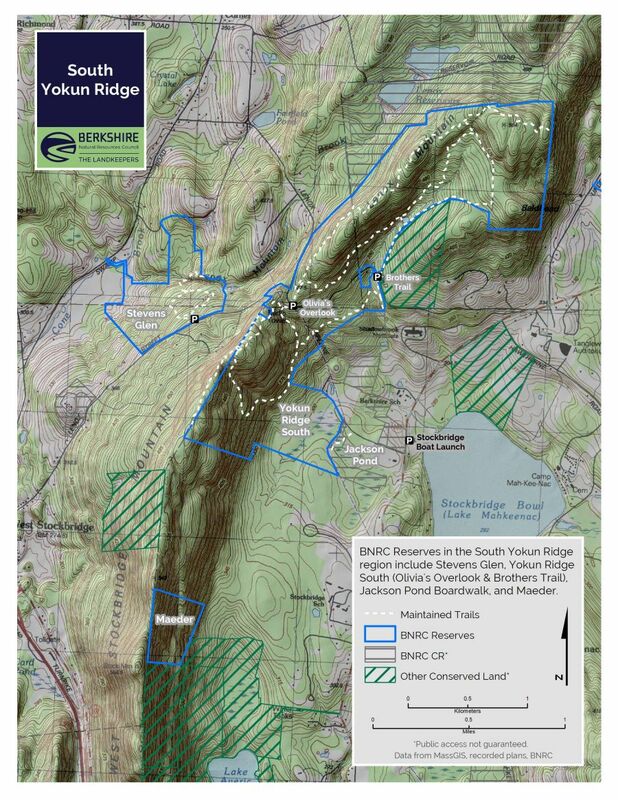 From the other side of the road, the Burbank Trail loops along the ridge and then down eastward to Monks Pond, with a connection to Old Baldhead Road. From Lenox: Take Route 183 west for 1.5 miles, passing Tanglewood. When Route 183 curves left, bear right onto Richmond Mountain Road (sign says to Rt. 41/Richmond). Drive 1.5 miles and the parking lot will be on your left. From West Stockbridge: Head north on Swamp Road and make an immediate right onto Lenox Road. At 2.0 miles, turn right and continue another 0.1 mile to Olivia’s Overlook on the right. From Pittsfield: Take Rt. 20 west 0.8 miles. Make a left onto Barker Road and drive 6.6 miles. Make a left onto Lenox Road and drive 1.8 miles to Olivia’s Overlook, on the right. From Olivia’s Overlook, head east down the road. Parking Lot is less than a mile down the road on the left. The Charcoal Trail, is a 1.6-mile loop named for the flat, rounded charcoal pits along the way. 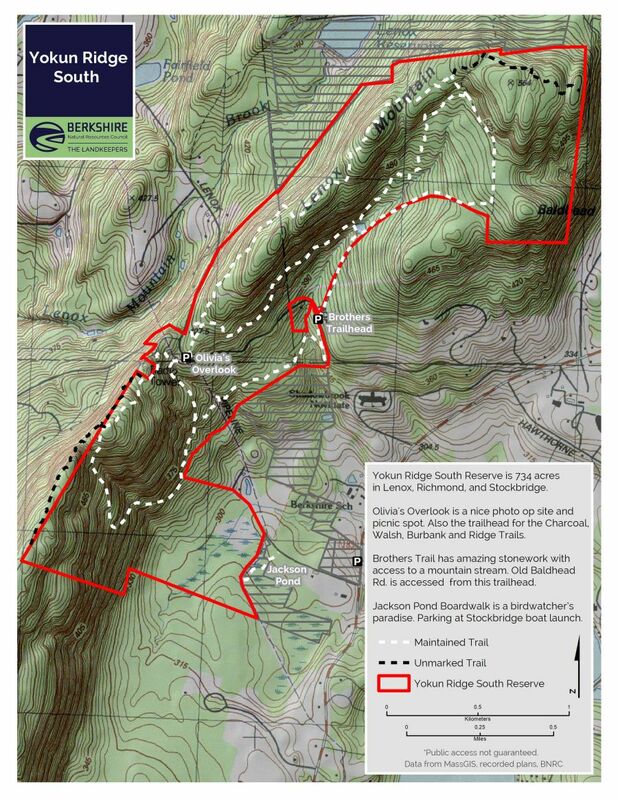 The trail provides views of Monument Mountain and West Stockbridge. The westernmost part of the loop offers easy grades and a wide tread. The Brothers Trail connects the Charcoal Trail to Old Baldhead Road, on the other side of Lenox-Richmond Mountain Road. Old Baldhead leads to Monks Pond, which once served as the Shadowbrook reservoir and owes its current name to the Jesuit successors of Shadowbrook’s original owner. The 3.2-mile long Burbank Trail begins directly across the road from Olivia’s Overlook, which is named for Olivia Stokes Hatch. She, with her husband John D. Hatch Jr. and her brothers Anson Phelps Stokes Jr. and Isaac N. P. Stokes—for whom the Brothers Trail is named—gave the land for this protected area. The brothers and sister are children of Shadowbrook’s original owner, Anson Phelps Stokes. Hikers can explore terrain that was once home to farmers and later became part of the estate of a Gilded Age financier, Anson Phelps Stokes, whose home, Shadowbrook, was the third largest private house in the United States when it was built in 1893. Later, the house was bought by a Jesuit order. When it burned down in 1956, the Jesuits rebuilt. It is now the Kripalu Yoga Center for Yoga and Health. Monks Pond is so named because it once supplied water to the Jesuit monastery. 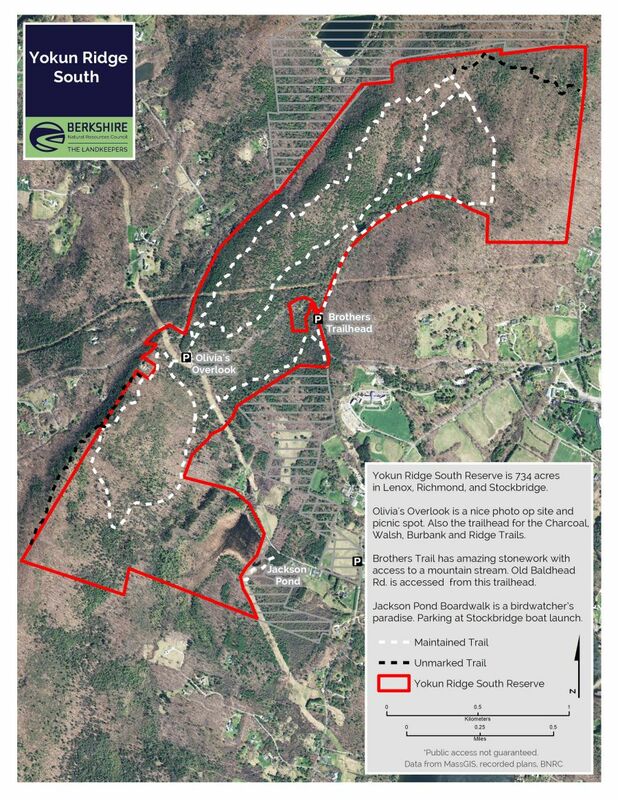 Descendants of Stokes gave much of this land on Yokun Ridge to the Berkshire Natural Resources Council in the early 1970s. This was the first conservation land owned in fee by BNRC and laid the foundation for the BNRC’s work to conserve land and ensure it is free and open to the public. The Brothers Trail is named after Isaac and Anson Stokes, sons of Anson Phelps Stokes. A gift by the brothers’ descendants in 2010 made it possible to carve out the trail. The lookout point on the Burbank Trail has a plaque honoring the land-conservation efforts on behalf of the Berkshire Natural Resources Council by attorney Kelton M. Burbank, for whom the trail is named. Decades ago, much of the ridge provided unbroken views in all directions, after sawmill loggers and producers of charcoal for local ironmaking stripped the area of its trees. Round, level charcoal pits can still be identified near the Charcoal Trail on the other side of Lenox-Richmond Mountain Road. The two homestead sites on the Burbank Trail bear witness to the attempts of local farmers to scratch an existence out of the cleared land high above the more fertile soil in the valley below. Stone walls that represent past land use can also be found on the property. Large stones in a wall typically are found in former pastureland, whereas a combination of large and small stones reflect cropland— the freeze and thaw cycle brings rocks to the surface each year and therefore would have to be cleared before plowing. The smaller rocks were then incorporated into the stone walls. On the Brothers Trail, trail builder Peter Jensen engineered the stone steps that lead visitors under the towering hemlocks of the gorge described by onetime Lenox resident Nathaniel Hawthorne as a “shady nook where summer had cooled herself.” From the top of the steps, the trail follows a carriage road dating to the original Shadowbrook estate, before returning to a single-track trail. The reserve’s trails take visitors past a boulder chain, mountain laurel and through a hemlock-shaded ravine. In addition to pine and oak, hemlock, sassafras and tulip poplars can also to be found. There are also saplings of American chestnuts that have not yet fallen victim to the blight that destroyed this mainstay of the Northeast’s forests in the early 20th century. In areas with little undergrowth beneath the mature trees, hikers can, if they are lucky, sight bears and other mammals common to hilly areas of the Berkshires. Yokun Ridge is also favorable habitat for barred owls, whose characteristic hoot can often be heard and sounds like “Who cooks for you? Who cooks for you-all?”.